If your question is not listed, please feel free to contact us at hello@britax-roemer.com. What do I need to think about before I buy an infant carrier or car seat? This means the car seat adheres to the strict European safety standards. You can also check out the safety ratings given to most seats by European testing organisations like Stiftung Warentest, Which? and ADAC. Our FIT FINDER® is a comprehensive car fitting tool that will help you check that our car seat is compatible with your car. This is a vital step both in ensuring that the car seat’s safety features will all be able to function in your vehicle, and also to ensure that you are fully insured should any accident occur. We appreciate that car seats are complex things. But we also believe it’s important for parents to make informed choices about the type of protection they offer your child. So we’ve pulled together some of the key safety features to consider in choosing your car seat. What kind of harnessing does it offer? 5-point harness, 3-point harness or a vehicle adult seat belt? Does it offer advanced side impact protection? In case of a common form of collision – from the side. Does it offer superior head and neck protection? To protect a growing child’s vulnerable head and developing neck muscles. Does it offer extended rearward facing travel? Proven to be the safer way to transport smaller children (and a legal requirement until 9kg). Move from a Group 0 + infant carrier when your child exceeds the weight limit and can sit up unaided, or if their head is higher than the top of the infant carrier. Move from a Group 1 seat when the upper edge of the shell is roughly at eye level of the child or your child exceeds the weight limit. Do not move too early to a Group 2-3 seat because these seats are wider to accommodate larger children. Also a younger child's shoulders are too narrow to hold to the adult seat belt securely. A small child can therefore easily slip out from under the belt, especially when they fall asleep during the journey. A child’s head should ideally never exceed the top of the seat shell. This is especially important when using an infant carrier in order to minimise the risk of head contact with interior components of the car should an accident occur. The recline angle of our ERWF child seats (DUALFIX, MAX-FIX II, MAX-WAY, MULTI-TECH, etc. ), is more upright than in an average infant carrier, which reduces the risk of the child’s head coming into contact with the car interior. Additionally, the child’s body is more supported over a larger surface area of the seat than they would be in an infant carrier where the child is in a flatter position. In our ERWF child seat models, the child can continue to use the seat until he or she reaches the maximum stated weight or their eye-line is level with the top of the seat shell/headrest. The child would typically outgrow the seat before reaching either one of these stages since the child’s shoulders would no longer fit beneath the headrest (found in most of our ERWF products) in its highest position. How do I choose the right seat for my family? What is the age and weight of your child? And how long do you want your child to stay in its seat? The first thing you will need to identify is which seats will ‘fit’ your child. This depends on the age and weight of your child. Once you’ve worked this out, your next decision is around the type of seat that will best suit your needs. Some car seats are designed around the physiology of a specific age or weight of child. These seats offer tailored protection along with the ultimate comfort and fit. Other seats are designed to cover a much wider age range. These seats offer maximum flexibility and longevity. Only you can decide what is best for your family. These seats, often called an ‘infant carrier’, can be used from birth and can be connected to your pushchair. They are designed to be lightweight and portable and cocoon a small baby. These seats are designed to be used from birth but to remain within the car. They are often bigger and heavier and can’t be connected to a pushchair. However they may fit your child until they are around 4 years or 18kg. And they may give you the option of changing the seat to forward facing once your child is ready. These seats are designed for children from 9kg up to 18kg and offer a range of installation and harnessing technology. These seats are designed for children from 9kg up to 25kg and often offer a choice of rearward or forward facing travel to suit the changing needs of a growing child. These seats are designed for children from 9kg up to 36kg and represent our longest lasting seat. These seats, often known as highback booster seats, are designed to offer ultimate safety for older children from 15kg to 36kg. What type of installation system will work with your car? Since we invented ISOFIX in 1997 with Volkswagen it has become the standard for car seat installation in Europe. It greatly reduces the risk of installation error and makes transferring an infant carrier when used in combination with the base in and out of the car simple. We would always recommend an ISOFIX seat, but understand that not all cars have ISOFIX connectors. So it’s important that you clarify this before you choose your seat. Our latest development of the ISOFIX system uses wider connectors to limit sideways movement, along with V-Tether anchorage at the top to reinforce stability and absorb impact forces. Do you want to use your seat as part of a Travel System? Only certain types of car seat, often called an ‘infant carrier’, can connect onto your pushchair. And all seats are not compatible with every brand or model of pushchair. If you choose the right combination then an infant carrier plus travel system can offer a flexible, cocooning way of transporting your small child on the road and pavement. All Britax infant carriers are compatible with all of our travel systems – and with many other leading brands of travel system. Would you like your child to remain rearward facing for longer? Current European legislation (ECE R44/04) states that a child must remain rearward facing until at least 9 months or 9kg. However at Britax we recommend that your child travels rearward facing for as long as is feasible for your child, your car and your lifestyle. We are proud to offer not just one of Europe’s broadest ranges of rearward facing seats, but one of the most advanced – with options to keep your child rearward facing until 25kg (or around 6 years old). We also understand that this isn’t possible for all families, so we have a range of seats that give parents the choice of when to change the direction of travel for their child. How do I choose the right pushchair for my family? We all know that comfort and a sense of security are vital for a young child. So think about not just their age, but their specific needs – do they want to be able to see you while they travel? Will they spend a lot of time sleeping in the carrycot? There are pushchairs to suit every set of needs. Do you have a small car boot, or very little storage at home? Will you walk a lot on tough terrain? Do you plan on building your pushchair into your fitness regime? Will you be using public transport? These kind of questions can help you identify not just which pushchair may be right for you, but which accessories may make all the difference. Do you need to connect an infant carrier or carrycot to the pushchair chassis? Do you need a seat that can face both forward and rearward? Are you particularly small or tall? What kind of folding mechanism will suit you best? What recline options do you need? What wheels will best suit where and how you live? Front wheels can be locked (for stability on uneven ground) or allowed to swivel (for easier cornering.) Large wheels cope well on sand, mud or snow, while smaller wheels enable a more compact fold. Quick-release wheels are perfect when you have limited storage or a small car boot. We have options to suit every need. Will you be out and about in weather extremes? We offer a range of hoods with extendable visors for protection from sun, rain, wind and more. Do you live in a country where it gets dark very early in winter? Some of our models have been designed with northern climates in mind – with 3M ScotchliteTM reflective strips for visibility in lowlight conditions. Is storage important to you? Will you be doing extensive shopping by foot? Are you planning regular family adventures equipped with all the paraphernalia they involve? If so, then consider the type and size of storage offered across our range. Suitable from birth until approximately 3 years, all-in-ones are a flexible system made up of a chassis, rearward and forward facing seat, carrycot and infant carrier adapters. They allow a small child to lie flat or travel in their infant carrier, a growing child to sit facing their parent and a toddler to sit facing the world – all in the ultimate comfort. Lightweight pushchairs are designed with the needs of urban families or growing children in mind. Though still suitable from birth (with an optional carrycot), they are designed to carry children until 15kg or 4 years. They are often available in 3- or 4-wheel models and offer a streamlined, flexible package. Double pushchairs are designed to accommodate the needs of growing families. Either side-by-side for maximum comfort, or tandem for maximum manoeuvrability – for children of different ages, or even for twins. Some doubles even have a removable seat so they can be used as a single when only one child needs to be transported. Active pushchairs are designed to strict safety rules – so they can cope with the speed and the forces of moving at higher speeds, on a mixture of terrain. They are also designed to be lightweight, shock-absorbing and impressively agile. They even come in double versions. What are the legal standards for car seats? It is mandatory to use child car seats within the EU for all children up to the heights of 1.35m or 1.5m – depending on the member state. i-Size (this is a new standard for group 0/0+/1 seats that will exist alongside ECE R44/04 for a number of years and sets more advanced safety standards based on more recent safety data). To meet ECE R44/04 approval car seats are tested in frontal collisions at 50km/h and rear collisions at 30 km/h using crash test dummies and advanced measuring instruments designed to assess the levels of protection each seat offers. ECE R44/04 approved seats can all be identified by their orange approval label. WHAT DOES THE APPROVAL LABEL TELL ME ABOUT MY SEAT? Your seat meets the European Safety Standard. Note the last two digits: these should end in 04 (latest version) or 03. R44-01 or 02 are not legal and may not be sold or used since 2008. There are 3 types of car seat approval: universal, semi-universal and vehicle specific. ‘Universal’ means your seat is approved for installation in all cars, although you should check that the seat fits really well in your car. See below article on ‘Type Labelling’. 4 = The Netherlands etc. Approval number. The first two numbers (04) show to which version the child seat has been approved, in this case ECE R 44/04. The seat is approved for use in all vehicles that meet ECE R14 and R16 regulations. Any Isofix car seat must use the Isofix anchorage points including the top tether or foot support and the vehicle’s handbook must state that the car is suitable for “Universal Isofix child seats”. Semi-universal approval is when, in addition to the standard requirements, other safety devices for attaching a seat are used and require additional testing. For example: some vehicles provide additional storage space within or beneath the floor area that can influence the behavior of a child seat foot support, therefore you need to check the child seat manufacturer’s car fitting list for your car type and model. The child seat is tested in an additional car-specific dynamic crash test and approved only for these cars. The car must be listed in the child seat manufacturer’s car fitting list. This may include special features or designs that can only be installed in a car of a specific type. i-Size is a new regulation for child car seats that will run in parallel to the current regulation (ECE R44/04) for the next few years. It has been in force since July 9th 2013. We were a major contributor to its development and believe that it will greatly increase protection for little ones across Europe. Reflecting the latest safety data and giving parents a clearer indicator of what seat is right for their child and when their child is ready to be moved to the next stage car seat. i-Size (or ECE R129) approved car seats can be recognized on the orange approval label by the “i-Size” indication. Additionally, one can easily find the appropriate length classification of the car seat on the label. The remainder of the approval label looks alike the ECE R44 label. What are the benefits of extended rearward facing travel? Physics dictates that in the event of a frontal collision, it is safer for a child to travel in a rearward facing car seat as crash forces are directed to the back of the seat, while the remaining energy is spread evenly across the head, neck and upper body. In a frontal collision with a forward facing seat the energy of the impact is distributed differently across the seat structure and restraint system – potentially resulting in more energy impacting on the child’s body. Our belief in the safety of extended rearward facing is supported by Swedish government advice and by safety organisations across Scandinavia. Sweden has the lowest car crash fatality rates for children in the world. We’ve been designing industry-leading car seats for approximately 50 years – and have been championing rearward facing seats in Sweden for over 20 years. During this time we’ve constantly used our learnings to develop innovative ways to make safer, simpler, more flexible products. Our research and development team are continually making advances in energy management – enabling us to enhance the protection that our products offer from every possible angle of impact (including rollovers) in a road traffic accident. We’ve also been able to develop an industry-leading selection of belted seats that enable rearward facing travel beyond the limits of ISOFIX – all the way to 6 years old. Our expertise is regularly shared with governmental bodies and safety experts worldwide. The PLUS Test is a voluntary test, which sets demanding standards for a seat’s ability to protect the head and neck in frontal collisions. Currently the PLUS Test is carried out on seats designed for the Swedish market – the only country in Europe where parents transport their children solely rearward facing up to four years. Not all child restraint systems have been able to pass the test since its introduction in 2009. Only nine car seats have passed the PLUS Test successfully – including our MAX-FIX II, HI-WAY II and MAX-WAY. What are the benefits of 5-point harnessing? Nearly 50 years of experience and constant technical innovation have enabled us to understand in minute detail what happens in different types of collisions. Based on our continually developing knowledge, a 5-point harness system is the only form of restraint we use on all of our Group 0+/1, 1 and Group 1/2 car seats – and we are increasingly finding ways to build extended 5-point harnessing into our Group 2 seats. What types of restraint systems are available? In Group 0 and 0+ children are generally restrained with a 3- or 5-point harness. In Group 1 children are restrained either with the 5-point harness or the shield system (also referred to as safety cushion, impact shield, tray shield). In Group 2 and 3 children are commonly restrained with an adult seat belt. However we are also working to champion extended 5-point harnessing for Group 2 so that children can benefit from the safety of 5-point harnesses for longer. How does a 5-point harness work in a collision? A 5-point harness significantly decreases the forces a child experiences during a crash since the forces are diverted from the child along the harnessing to the five points of contact with the seat. When the child is decelerated by the harness, the cushioning occurs across a wide area and limits shoulder and hip movements, resulting in low stress to the spine and the forces being directed away from the parts of the body containing vital organs. In case of a roll-over, side impact or an offset impact (where combined vertical, lateral and or oblique loading lateral forces can lead to ejection or submarining), the shoulder contact points and the crotch strap stop those risks and keep the child safely in the protecting seat shell. In addition, the harness allows for adjustment to the child’s body and therefore offers a good and customised fit. Why do we use a 5-point harness? In all 5-point harness seats, the straps come down over the shoulders and across the hips to fasten to the buckle that comes up between the legs. The harness sits closely against the bony parts of the pelvis (the crotch and hip straps) and across the shoulders and rib cage (the shoulder straps). When a child moves forward in the seat, as they would in a crash, the properly tightened harness is already "holding" the child and it effectively restrains them, spreading the crash forces out through the seat and the remaining forces across the strong bones of the body. Why are child car seats with integrated harness often more expensive than car seats with shield systems? Harnesses are complex to design. The visible part is only a small fraction of the total harnessing system, which comprises straps, tongues, crotch strap, attachment means to the shell and a key element: the buckle. Technology is needed to allow easy tightening and release of the harness, and the harness needs to be routed around the shell to allow connection at the right points for the load to be distributed whilst providing easy access to the parents securing their child in the seat. In addition, designing a shell which can properly withstand the forces the harness places on the upper shell, to effectively restrain the upper body, is technically advanced and costly. Can I use a second-hand car seat? We believe that risks shouldn’t be taken when it comes to child safety. A second-hand car seat with an unknown history is always a risk as you cannot be sure that it hasn’t been involved in an accident (even if there are no visual signs of damage). Can I use car seats from the United States? American child seats are approved according to the US standard FMVSS 213. In Europe, child seats must conform to the European safety standards ECE R44/04 or ECE R129. Therefore we always recommend that parents choose only car seats that conform to the European standards for use in Europe. I've noticed a slack in the vehicle seatbelt while using my Group 2/3 child seat. What should I do? The function of the vehicle seatbelt in a Group 2/3 child car seat (Britax KIDFIX II XP (SICT), KIDFIX XP (SICT), KIDFIX SL (SICT), KID II, DISCOVERY SL and ADVENTURE) is to hold it and the child firmly and properly in place. Insufficient (incomplete) seatbelt retracts can be a common issue with Group 2/3 child car seats. There are many factors that contribute to this including the temperature outdoors and in the car, as well as the angle of the vehicle seatbelt as it goes through the upper belt guide of the child car seat. Since the upper point at which a car’s seatbelt connects to the body of the car is not the same in all cars, the result varies case by case depending on car type, child car seat, headrest position and other circumstances. Upon purchasing the child car seat, it is important to do an installation test. Please also try to ensure that the vehicle seatbelt retracts sufficiently when your child is sitting in the child car seat. To determine if you have an issue, please check the vehicle seatbelt retraction when using the Group 2/3 child seat. Please always follow the user guide of the car seat (incl. type lists if applicable) and car for the installation of the child car seat. 1) When your child is sitting in the child car seat, make sure that the vehicle seatbelt runs smoothly and securely through the upper belt guide and lower belt guide. 2 ) It is important that the vehicle seatbelt fits snugly and consistently against the body of the child so that it keeps the child and child safety seat securely in place. Always make sure the seatbelt is properly fastened and ensure that it is not twisted. Adjust the headrest of the child car seat so that the headrest is, where possible, 1-2 slots higher or lower (subject to the height of the child and additional guidance in the user manual) than its previous position. If the belt-retract is still insufficient and the child car seat has an XP-PAD, please test the belt-retract without using the XP-PAD. If the seatbelt sufficiently retracts without the XP-PAD, then the child car seat should be used without the XP-PAD. Even without the XP-PAD, the child car seat still provides superior safety performance. Should these steps not solve the issue, then please do not use this car seat and contact Britax customer service immediately. If the vehicle seatbelt remains properly in place when your child moves around while seated, but does not fully retract when your child climbs out of the car, then you can use the child car seat without any restrictions. 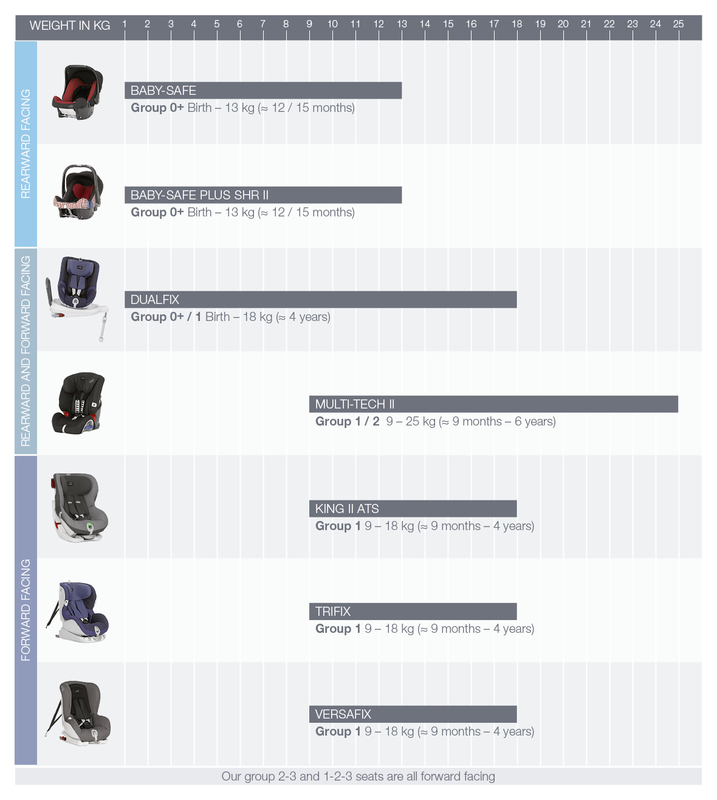 What pushchairs are compatible with Britax infant carriers? All Britax infant carriers are compatible with all Britax and Britax BOB pushchairs. They are also compatible with the below models from other leading pushchair brands. Please ask trained store staff for the required adaptors and do contact the pushchair manufacturer if you have any further questions. Can I use my car seat on a plane? Suitable for children up to 13kg, or until the head extends over the edge of the infant carrier. The label certifying suitability for airline use can be found on the car seat. Suitable for children from 9 to18 kg. This model is approved for airline use subject to airline regulations. Accessory Kits is necessary and available from your dealer. As airline regulations regarding suitable car seats can change regularly, we recommend that you always check with your airline before travelling. My baby is sweating heavily in his seat - what should I do? Sweating in young babies can often be a sign that their ability to thermo regulate is still developing. We advise that parents use their judgement in terms of how their child is dressed if they appear to be hot. However we also offer specific summer accessories for some of our car seats. Please do check our accessories section for further details. When my small baby is very upright in his seat his head sometimes falls forward. What is causing this and what can I do? If a qualified car seat fitter advises that the angle of the infant carrier shell is too steep on the vehicle seat, then for the BABY-SAFE ISOFIX BASE and BABY-SAFE BELTED BASE (which are compatible with the BABY-SAFE, BABY-SAFE PLUS and BABY-SAFE PLUS SHR II) you can request a free inclination adapter – either from your local retailer or by contacting our Customer Service Department. This adapter is very easy to install using the supplied instructions. For BABY-SAFE i-SIZE we recommend using the BABY-SAFE i-SIZE FLEX BASE as this allows you to adjust the base angle, providing a flatter lying position for your baby, keeping them comfortable and safe. Please check our vehicle list to see if the base is compatible with your car. My child can unbuckle his seat himself / my child can get out of the harness by himself. What should I do? In designing our restraint systems we aim to strike a delicate balance in terms of the forces needed to open a buckle – high enough to deter children from opening it themselves, but not so high that the buckle can’t be opened by someone else in case of a dangerous accident situation. Equally a more complicated lock system is not legally permitted if it could also prevent an adult being able to open the buckle in an emergency. In terms of harnessing, we recommend that parents find the best balance between tightening the harness so tautly that the child is uncomfortable and tries to escape from it – and tightening it so loosely that it is easy for the child simply to slide out of the harness. The harness should be a tight fit but without tension against the body (two fingers should be able to fit between the harness and the child's chest). If your child unbuckles or slips out of his harness we recommend that you stop immediately and re-harness your child. My car seat was in our vehicle during an accident. What should I do? After an accident in which a car seat had been involved, we strongly recommend that the seat is replaced if involved in an accident at speeds of 10 kmph or more as the forces absorbed by the seat could lead to fine cracks in the structure (which may not be visible to the eye). Can I use a rearward facing child car seat on the front passenger seat with an airbag? Infant carriers from Group 0/0+ must be fastened in a rearward facing direction. These seats should not be used in conjunction with an airbag on the passenger seat. The same applies to our Group 0+/1 and Group 1/2 products such as FIRST CLASS PLUS, MAX-FIX II, DUALFIX when in rearward facing mode, MAX-WAY and MULTI-TECH II – however for MAX-FIX II and DUALFIX, they can only be used in cars that also have ISOFIX connection on the front seat. Please refer to your car seat and vehicle instruction manuals. Can I use a forward facing child car seat on the front passenger seat? Britax car seats in Groups 1 and 2-3 can be used in principle in the passenger seat. The same applies to our Group 0+/1 products such as FIRST CLASS PLUS and DUALFIX when in forward facing mode. However, it is advisable to move the front passenger seat as far back as possible if a passenger airbag is activated. Please refer to your car seat and vehicle instruction manuals. In general, children should be transported on the rear seats as much as possible where there is less risk of injury in case of an accident. Can I use an infant carrier or car seat in a vehicle with side airbags? Unlike the front airbag on the passenger side, the side airbags only inflate a small amount – so they have minimal contact with the child car seat. As long as a child is properly secured within the car seat and cannot lean out if it, the use of a car side airbag does not pose a risk. If you are concerned, we advise that you contact the vehicle manufacturer to ask how far the side airbags come out if they deploy and whether they are likely to contact a child restraint in the rear outboard seats. EuroNCAP tests include assessing the safety of child seats in a side impact, so check www.euroncap.org to see if your vehicle model is one of those that has been tested. Can my child keep its winter coat on in the car? If a child is wearing a very thick coat, there is a risk that the harness or car seat belts cannot be tightened to sufficient tension. So we would recommend in general that very thick coats are removed in the car and the child is covered with a blanket over the top of the harness if extra warmth is needed. What warranty do you offer on Britax products and who should I contact? We offer a guarantee for manufacturing or material defects on all products for two years. The warranty period begins on the date of purchase. Please retain your receipt as proof of purchase and complete your warranty card if available. For any warranty enquiries please contact the retailer where you purchased your seat. Where can I buy accessories / loose covers / spare parts? Please check with your local retailer for all accessories and spare part needs. Are the seat covers washable? The cover can be removed and washed with mild detergent on a gentle 30 °C cycle. Please follow the instructions on the washing label of the cover. Do not place on a spin cycle and do not place in a tumble dryer. I've lost my instruction manual - where can I find a new one? For instruction manuals for our current models, please click here. My child can release the child bike seat’s harness buckle by himself. What should I do? As with child car seats, it is possible in rare cases that children can release the harness buckle of a child bike seat by themselves. The standard for child bike seats explicitly states that the maximum force allowed to release the buckle should not exceed a specific value and thereby implies that children can also release these harness buckles. We advise parents not to buckle their children so tightly that they are uncomfortable and want to get out of the harness. However, the harness should not be so loose such that children can slip out of it. The harness should fit closely without putting pressure on the body (it should be possible to slip two fingers between the harness and the child’s chest). If your child tries to get out of the harness, we recommend you stop immediately and re-buckle the harness. It is important to talk to children and explain to them that they shouldn’t release the buckle. What is the expiration date of my child seat? Although Britax Römer child seats do not have an official expiration date as we use high-quality UV-stabilized material to prevent aging effects, we endorse the general advice of The European Nursery Products Confederation and suggest that these should be used as sensible guidelines. The count for the lifespan begins when the product is first used. Functional parts of the products may have reduced performance due to wear or exposure to external factors, such as food and drinks. Britax Römer does not recommend the use of a second-hand car seat with an unknown history as you cannot be sure that it hasn’t been involved in an accident (even if there are no visual signs of damage) or that parts, labels and instructions may have got lost.